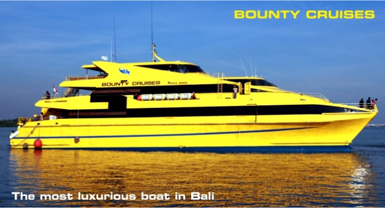 " PAKET CRUISES MURAH DI BALI "
Keberangkatan : 09.00 - 16.00. Snorkeling - Aqua board - water slide - Under water viewing chamber - semi sub marine - canoeing, banana boat - village tour - Water trapoline - International buffet lunch - one voucher soft drink, morning and afternoon tea or coffee with snack on board and optional for diving and massage. Welcome Drink, & flower upoon arrival, international Buffet Dinner, free flow beer & orange Juice during the cruise, on board DJ Balinese Dance, modern Dance, Exotic belly dance, trio Singers, commedy cabaret show, live band.